Didem Mert looks to make connections between the utilitarian object and its counterparts—the user and/or the object’s environment. As the daughter of a woodworker, Didem was raised in a design-rich environment and the geometry, texture and functionality of her ceramic work emanates from this artistic environment. To create different textural surfaces, Didem uses pinched marks juxtaposed between smooth, defined lines and edges. Further, bright colors paired against a soft earthy color palette create high-contrast focal points in the work. Didem's work strives to bring forth a sense of tranquility in its minimalistic design, while maintaining a sense of playfulness directed through the color palette and pinched surfaces. Didem received her MFA in ceramics from Edinboro University of Pennsylvania in 2017 and her BFA in ceramics from Northern Kentucky University in 2014. 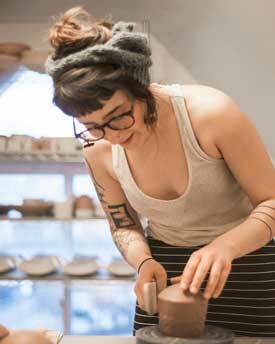 She was chosen as one of Ceramics Monthly’s Emerging Artists of 2018, and is currently a studio artist living in Cincinnati, OH.